Just two days ago, I told you about the improved search features on Gmail, if you thought those were cool — you would love this even more! Have you ever wanted to send very large files by email attachments before? Just few weeks ago I had to help a not-so-tech-savvy guy in the next office to mine compress and zip up some video files he wanted to send by email to even more not-so-tech-savvy recipients! Now if you are like my friend in the next office, you are in for better times sending files by email. Google made it known Tuesday that it will be integrating Google Drive into Gmail, this would make it possible for you to send files up to 10GB in size by email. 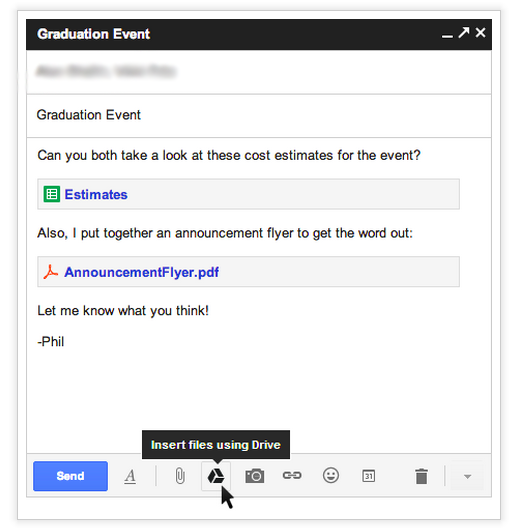 A new button in the Gmail compose window will afford users the ability to attach a file from their Google Drive account rather than attaching the file itself to the message. Once the attachment is done, Gmail will ensure that your recipient has appropriate permission to view the file in your Drive account -– or will prompt you to grant that permission –- and then sends the message. What’s more, you can simply use this new feature by just copying and pasting links to files on your Google Drive into your message — a piece of cake! This new feature, just like other Cloud Services such as Dropbox and Box — you might be used to on both PCs and mobiles, makes collaboration as easy as a walk in the park since you are merely sharing a link to the file in the cloud rather than the file itself. In essence, you can continue to update the shared file, with those updates showing up for your recipient as well — this way you can keep a single copy rather than passing drafts to and fro. Each Google Drive user has got 5GB of free storage from Google. In order to store and send files larger than 5GB users will be required to purchase additional Google Drive storage space to ‘house’ those files. At the moment, you can purchase 25GB of additional Google Drive storage for $2.49 per month, or 100GB for $4.99 per month. Don’t you just like the new Gmail? Tell us about it in the comments. ← Microsoft tells IE haters – Get a life!